Tooth loss is a common result of gum disease, tooth decay, or injury. Fortunately, dental implants in The Village of Cross Keys offer a solution for those wishing to regain their smile. Read on to learn more about dental implants and decide whether they’re an option for you. During the dental implants procedure, implants are inserted using cylindrical posts made from titanium. Endosteal dental implants, which are the most common type, are inserted directly into the jawbone during dental implant surgery, while subperiosteal dental implants are inserted under the gum but above the jaw. As your jaw heals, the dental implants will fuse with your natural jawbone. The titanium posts serve as the foundation for a natural-looking crown. Dental implants look and function just like natural teeth. If you’re ready to restore your smile, give us a call to learn about our affordable dental implants. The cost of dental implants varies widely depending on the surgical materials needed and whether you receive endosteal or subperiosteal dental implants. If any additional surgeries are required, they also will be factored into the total dental implants cost. During your consultation with one of our implant dentists, he or she will outline your personalized dental implants cost. Should your dental implants insurance plan not cover the procedure cost, our financing plans give patients of all budgets a chance to receive affordable dental implants regardless of dental implants insurance coverage. Many dental implant insurance plans do not cover the full cost of the dental implant procedure. The cost of dental implants with insurance will vary based on the intensity of your treatment and how many dental implants are needed. If your plan doesn’t provide sufficient insurance coverage, our convenient payment plans can help make the cost affordable. We work closely with many major insurance companies to help patients afford treatment. Call us today to learn more about our budget-friendly dental insurance implants options. For many patients, dental surgery causes nervousness. Learning about the dental implant procedure steps can greatly reduce anxiety on surgery day. The process of dental implants begins with the dentist preparing the site for surgery. Following surgery preparation, the dental implants are inserted either directly into or above the jawbone, depending on whether your receive endosteal or subperiosteal implants. As your jaw heals, your implants will securely bond to your jawbone, and your new crown will perform just like a regular tooth. Post-treatment dental implant procedure pain is managed with over-the-counter pain medication. Consult with your dentist if you have any concerns or questions regarding the procedure steps. 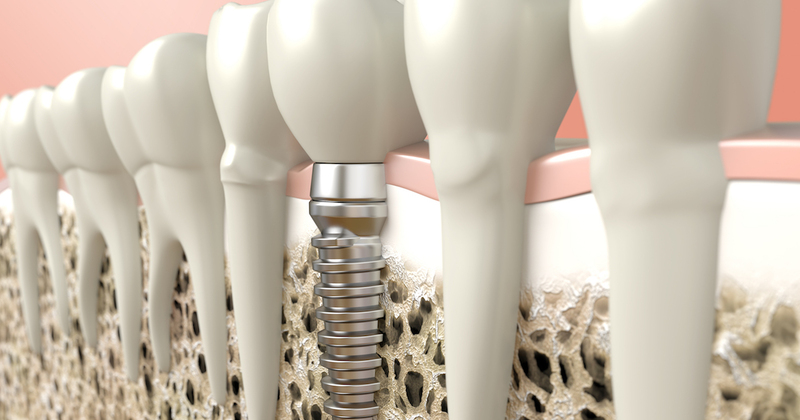 Dental implants function just like regular teeth, so dental implant care after surgery is easy. Simply brush and floss your teeth like you normally would, and use antibacterial mouthwash. If you experience discomfort after your dental implants procedure, pain can be relieved with over-the-counter medications. Who can benefit from dental implants in The Village of Cross Keys? Anyone who is missing teeth and wishes to regain their smile and confidence can be a candidate for a dental implants procedure. The best dental implant candidate is someone who has generally good gum health and enough healthy jawbone to support the dental implants. Additional surgeries may be required if you cannot sustain a bone graft. Find out if you’re someone who needs dental implants by scheduling an appointment with our office. The Big Question: How Long Does a Dental Implant Last? Dental implants can last from 10 years to a lifetime with proper oral care. Practicing good oral hygiene and scheduling regular appointments at our dental office will help keep your implants in excellent condition. How long dental implants last depends on how well you maintain them. If you’re ready to achieve a healthier smile, call our office today to schedule a dental implants consultation.